For more than 15 years..
thousands of people, who had bought an old fiberglass boat.. heard about Kev “Fin” Mueller. 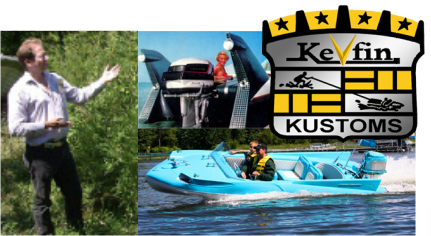 Kevin started collecting back in 1991 and has found and collected many of the world’s rarest designer speedboats. See one of KevFin's TV Interviews from the "My Classic Car" Show which was visiting Preservation Park on the Rock River in Beloit where Kevin held some of his boat shows. This event was the Beloit Car Show. Custom Built For The True Connoisseur"
Both are Available by special order.. The "Boats In The Belfry DVD" includes KevFin's lecture at the Antique Boat Center, a tour of his collection at "Fin City" and a Classic Boat run down the Rock River. Kevin Mueller's shop where he specializes in custom designed pieces. Soon in the Belfry Archive You will see the history for one of the most ambitious Classic Re-Creation projects ever attempted. Learn how KevFin and his crew meticulously duplicated Brooks Stevens' futuristic “Dream” Boat, The Evinrude Lark Concept Boat and the Cadillac Sea Lark Prototype boats.. Enjoy lot's of informative and fun videos about Classic Boating..